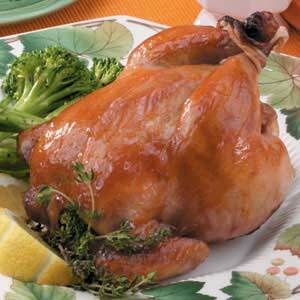 This is a wonderful change for Christmas dinner from the traditional turkey or ham. These golden brown game hens are treated to a citrusy cinnamon-apple glaze that's simple but special enough for a standout entree. Prepare the hens the day before so they are ready to pop in the oven on Christmas day. Tie legs of each hen together; tuck wings under hens. Place on a greased rack in a roasting pan. In a small saucepan, combine cornstarch and apple juice concentrate until smooth. Stir in the lemon slices and cinnamon. Bring to a boil; cook and stir for 1 minute or until thickened. Spoon half of the glaze over the hens. Bake, uncovered, at 375° for 1 to 1-1/4 hours or until a meat thermometer reads 180°, basting occasionally with remaining glaze. Yield: 6 servings.